We are still on the path that Christ has given Mother Church: eternal life. It takes a long time to accept the fact the God the Father through His Son Jesus nourishes, strengthens, and guides our way through all of life’s challenges. Within human limit we are given grace. The matter is: do recognize the graces? These weeks we are given extensive sections of the Bread of Life discourse; John 6 is our text for meditation. Yesterday, after Mass, I spoke with a friend who is a few years my senior who told me she is now learning what it means ‘to give all to God.’ She freely admits (I can relate to the experience) that she always seems to have a fingernail of reality saved of the self reserved for herself. Thus, she knows that not everything is given to God. The spiritual masters, as we have heard, tell us that we need to abandon everything to the Lord. Yes, all things are given to Christ change; nothing is reserved for the self –absolutely nothing. I find this advice to be true, but rather difficult to live because I always want to keep something for myself. Deep down the difficulty surfaces because I don’t trust enough the relationship I have with the Lord; eternal life is not a merit badge for a life well-lived. In other words: do believe the promises of the Lord are too good to be true? What I am finding more and more among those who claim to be in relationship, friendship with Christ (i.e., those who claim for themselves to be “good Catholics”) is how shallow said relationship with the Lord really is. What I am finding from people a bunch of alternative reasons NOT to worship Him (the 3rd commandment), not to serve our neighbor (MT 25), not to live in the Mystical Body of Christ –the Church (St Paul), are too prevalent and easy. Too many Catholics are zombies. The first reading for today’s Mass comes from the Book of Proverbs which tells us that our task in the spiritual life is about ‘forsaking foolishness’. What is foolishness? Foolishness can be seen as anxiety, worry, sin, making excuses, expressed anger, addictions, living with a lack of a pure heart –all leading to being unfaithful and spiritual and human death. Foolishness unworthy of the Eucharist. Only being faithful to Jesus Christ will give us eternal life (permanent life, peace and love, beatific vision –communio with the Trinity). Faithfulness to whom? Only to Jesus Christ will fulfill our hunger for eucharistic living. Only to Jesus in the Holy Eucharist leads us to eternal life. This eucharistic theme is explained by the Holy Father. Before we get to Pope Francis let us consider what the great Saint Irenaeus taught: “Just as the bread that is made from the earth, when it receives the invocation of God, is no longer ordinary bread but the Eucharist, consisting of two realities, earthly and heavenly, so also our bodies when they receive the Eucharist are no longer corruptible, having the hope of the resurrection to eternity.” Is this what we really believe? On these Sundays, the Liturgy proposes to us, from the Gospel of John, Jesus’ discourse on the Bread of Life, that is He Himself and that is also the Sacrament of the Eucharist. Today’s passage (Jn. 6, 51-58) presents the last part of that discourse, and refers to some of those among the people who are scandalized because Jesus said: “Whoever eats my flesh and drinks my blood has eternal life, and I will raise him on the last day” (Jn. 6,54). The astonishment of those listening is understandable; in fact, Jesus uses the typical style of the prophets to provoke in the people – and also in us – questions and, in the end, to make a decision. The first of the questions is: What does “eat Jesus’ flesh and drink his blood” mean? Is it only an image, a way of saying, a symbol, or does it indicate something real? To answer this, one needs to guess what is happening in Jesus’ heart while he breaks the bread for the hungry crowd. Knowing that He must die on the cross for us, Jesus identifies Himself with that broken and shared bread, and that becomes for Him the “sign” of the Sacrifice that awaits Him. This process culminates in the Last Supper, where the bread and wine truly become His Body and His Blood. It is the Eucharist where Jesus leaves us a precise purpose: that we can become one with Him. In fact, he says: “Whoever eats my flesh and drinks my blood remains in me and I in him” (v.56). To remain: Jesus in us and us in Him. Communion is assimilation: eating Him, we become Him. But this requires our “yes”, our adherence to the faith. At times, during the Holy Mass, it may happen to feel this objection: “What is the purpose of the Mass? I go in Church when I feel like it, and I pray better alone.” But the Eucharist is not a private prayer or a beautiful spiritual experience, it is not a simple commemoration of what Jesus has done in the Last Supper: we say, to understand well, that the Eucharist is a “memorial”, that is, an act that actualizes and makes present the event of the death and resurrection of Jesus: the bread is truly His Body given to us; the wine is truly His Blood that has been shed. The Eucharist is Jesus who gives Himself entirely to us. By nourishing ourselves from Him and remaining in Him through the Eucharistic Communion, if we do it with faith, it transforms our life; it transforms it into a gift to God and a gift to our brothers. To nourish ourselves from that “bread of life” means being in tune with the heart of Christ, to assimilate His choices, His thoughts, His behavior. It means entering into a dynamic of sacrificial love and become a person of peace, of forgiveness, of reconciliation of sharing in solidarity. It is the same as Jesus has done. 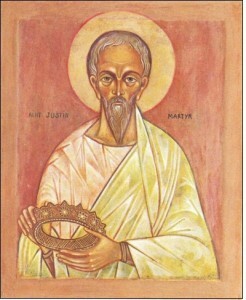 Jesus concludes his discourse with these words; “Whoever eats this bread will live forever” (Jn. 6,58). Yes, living in a concrete, real communion with Jesus on this earth makes us pass from death to life. The heavens begin precisely in this communion with Jesus. In Heaven, Mary our Mother awaits us – yesterday we celebrated this mystery. May She obtain for us the grace of nourishing ourselves always with faith in Jesus, the Bread of Life. I love the gospel readings for the month of August because they give us the eucharistic theology of Divine Presence and the Divine Pledge for Eternal Life. These readings are known as the Bread of Life discourse taken from the Gospel of Saint John (chapter 6). You might say that the readings from Saint John’s gospel offers a timely reflection and orientation for eucharistic coherence. They indeed do, and this is no small gift these days when you hear more disagreement of what the Holy Eucharist is and why we receive Him. Faith informs me that sacramental Communion is Jesus Himself. Whom do we receive in Holy Communion? 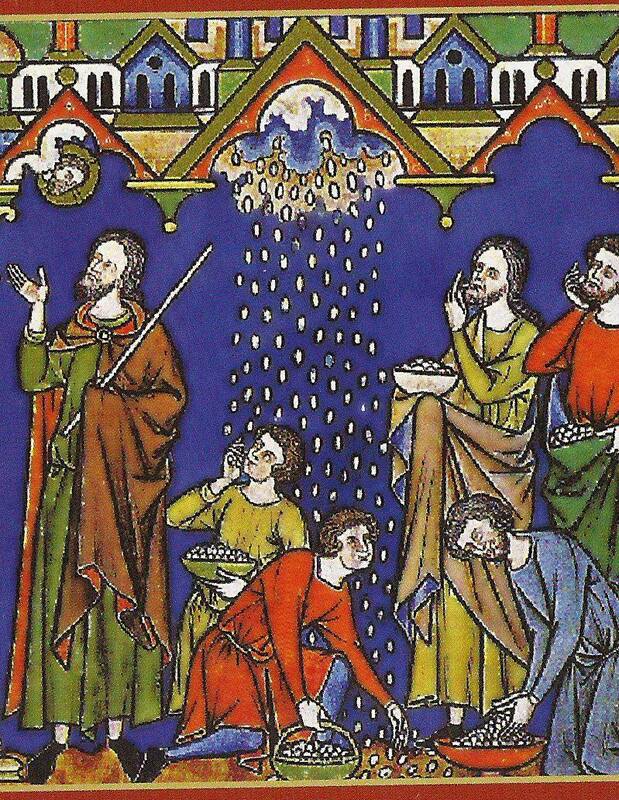 The first reading today for the sacred Liturgy of 18th Sunday Through the Church Year, reveals the pouring out from heaven of manna for the people of Israel. The manna, you will recall, is an Old Testament type for what is revealed by Jesus in the feeding narratives and then as the Holy Eucharist. 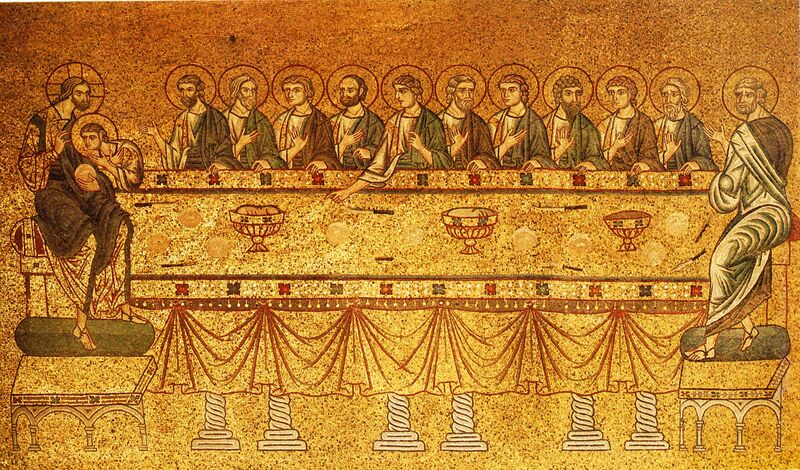 A central image of Jesus in the Gospel of St. John (John 6:24-35) is that He is the Bread of Life; later we speak of this as the heavenly banquet, the spiritual food for eternal life, as a holy sacrament. Christians believe the OT typology is a direct prefiguring of what is revealed in the NT narratives where we read of Christ’s multiplications of bread, signs of Eucharist (Thanksgiving, of heavenly food on earth), of Jesus Christ being the Bread of Life. The good news here is that God, our Provident Father, provides for us in varied ways: He nourishes us and gives us the medicine of immortality. 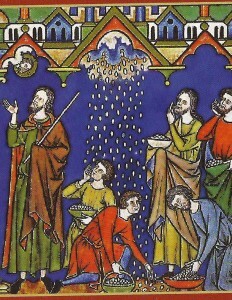 The image is a striking one: it is a medieval illumination from the Morgan Bible called “Give Us This Day.” Indeed, may we worthily received the gift of the Bread of Life for our salvation. Today, we celebrate the liturgical memorial Saint Pius X and the centenary of his death. He was the 257th pope. The Eucharist, in part because of Pius, is far more central to our lives as Catholics than before him. His intuition and boldness of teaching open new doors to radical gift of the Holy Eucharist. Rome Reports has a brief presentation on Pius. 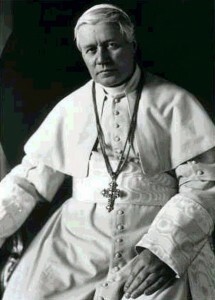 A priest above all in the Eucharistic ministry: this is the most faithful portrait of St. Pius X. To serve the mystery of the Blessed Eucharist as a priest, and to fulfill the command of Our Savior “Do this in memory of me” (Luke 22:19), was his way. 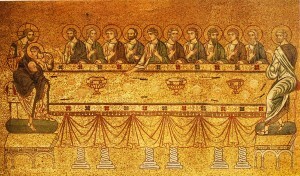 From the day of his sacred ordination until his death as Pope, he knew no other possible way to reach such an heroic love of God, and to make a such generous return to that Redeemer of the world, Who by means of the Eucharist “poured out the riches of His divine Love for men” (Council of Trent, Session 13, chapter 2). One of the most significant proofs of his priestly sensibility was his ardent concern for the renewal of the dignity of worship, and his concern to overcome the prejudices of an erroneous practice, by resolutely promoting the frequent, and even daily, Communion of the faithful at the table of the Lord, without hesitation, leading children thereto, lifting them up, as it were, in his own arms, and offering them to the embrace of God hidden on the altars. From this, sprang up a new springtime of the Eucharistic life of the Bride of Christ. A providential example for today’s world, where earthly society is becoming more and more a mystery to itself, and anxiously searches for a way give itself a soul! Let it look, then, for its model at the Church, gathered around its altars. There in the sacrament of the Eucharist mankind truly discovers and recognizes its past, present, and future as a unity in Christ. Conscious of, and strong in his solidarity with Christ and his fellow men, each member of either Society, the earthly and the supernatural one, will be able to draw from the altar an interior life of personal dignity and personal worth, such as today is almost lost through insistence on technology and by excessive organization of the whole of existence, of work and even leisure. Only in the Church, the holy Pontiff seems to repeat, and though Her, in the Eucharist which is ‘‘life hidden with Christ in God,” is to be found the secret and source of the renewal of society’s life. Hence follows the grave responsibility of those who, as ministers of the altar, have the duty of it is to open up to souls the saving treasure of the Eucharist. 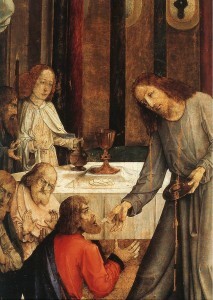 There are indeed many forms of activity which a priest can exercise for the salvation of the modern world; but only one of them is without a doubt the most worthy, the most efficacious, and the most lasting in its effects: to act as dispenser of the Holy Eucharist, after first nourishing himself thereof abundantly. His work would not be that of a priest, if, even through zeal for souls, he were to put his Eucharistic vocation in second place. Let priests conform their outlook to the inspired wisdom of Pius X, and orient every activity of their life and apostolate by the sun of the Eucharist.